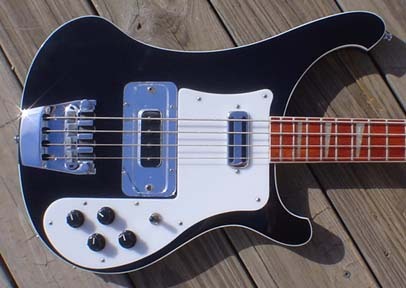 To fit most modern (90’s & up) Rickenbacker® 4003 basses. Available with flush, beveled or rounded-over edges; right or left handed; standard or moved hole 1 position; 1″ or 1/2″ pickup spacing. Give your 4003 a vintage 60’s look! This Rickenbacker® 4003 guard will fit most mid-90’s to current 4003 basses. Available with standard 1″ neck pickup placement or custom 1/2″ placement (requires routing the body in most cases). Also available with Standard screw hole pattern for direct replacement or with a moved Hole 1 (closest to the bridge pickup) for a more “correct” position in the corner (requires drilling a new hole in the body). Hand-polished edges on acrylic material. See our Finger Rest page for an even more vintage look. I have had one of these conversion guards on my 4003 for awhile now. I love it. Tony does fantastic work. The one I got is clear / back-painted and it I like it much better than the original pickguard. Nothing against the original guard, I just always wanted one that goes back to the pickup surround. He matches up to the original holes, so it’s completely reversible if you ever decide to put the original back on. This is the second bass I’ve had them make a guard for and if I ever want / need another, Pickguardian is where I’ll go.